What a great food find Nick and I have made! A charming local neighbourhood eatery that serves up simple, seasonal, creative and perfectly prepared dishes, Kiwiana is sure to become a regular weekend brunch spot. Practically sitting on our doorstep, I can’t believe we had not been before. Shame on us! 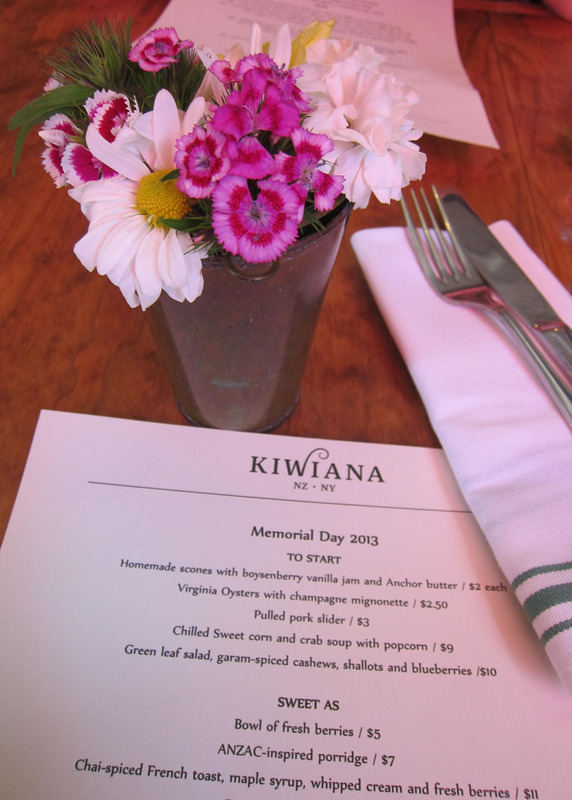 As the name suggests, Kiwiana is a restaurant that serves up local dishes with a New Zealand ‘Kiwi’ twist. Chef Mark Simmons who hails from New Zealand combines culinary traditions and ingredients of New Zealand (that are near impossible to come by in New York) with standard American food fare. The menu features NZ inspired meals like, Manuka and Marmite braised baby back ribs, New Zealand rib eye, and the extremely popular Kiwi Burger (ground beef, fried egg, cheddar and beetroot with hand-cut fries), just to name a few. Classic NZ desserts fill the ‘Sweet As’ section of the menu too. Like, Pavlova with kiwi fruit, berries and whipped cream, Raspberry Lamingtons and even homemade hokey pokey ice cream. Coming from Australia I question the origin of the Pavlova and Lamington, however there’s no denying the origin of the Hokey Pokey ice cream, that ones all Kiwi. Stopping by for a quick eat both Nick and I indulged in the daily special of ‘Chicken and Waffles’. Only having been introduced recently to the chicken and waffle combo, I could not pass up the opportunity to give this unusual pairing a try. And oh my, was it good! 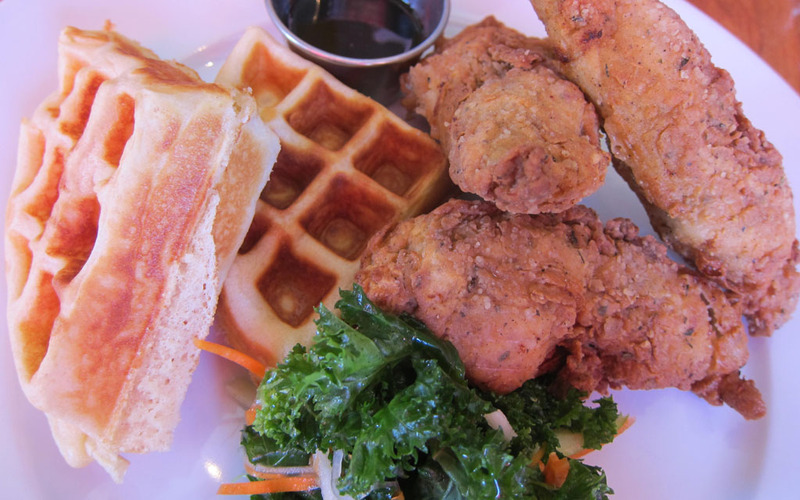 The combination of crispy buttermilk-fried chicken, topping a sweet, fresh waffle, with a drizzle of truffled manuka honey on top – was seriously good. Who would of thought, hey? We drank Kiwi Fruit Mimosas, which were fresh tasting and not too sweet. And finished our meal with a raspberry lamington, which was light, fruity and delicious! Like the food, the restaurant has touches of New Zealand flavour and character. New Zealand memorabilia hang on the walls, as does a teaspoon collection gathered by the Chef’s parents on their worldly travels. 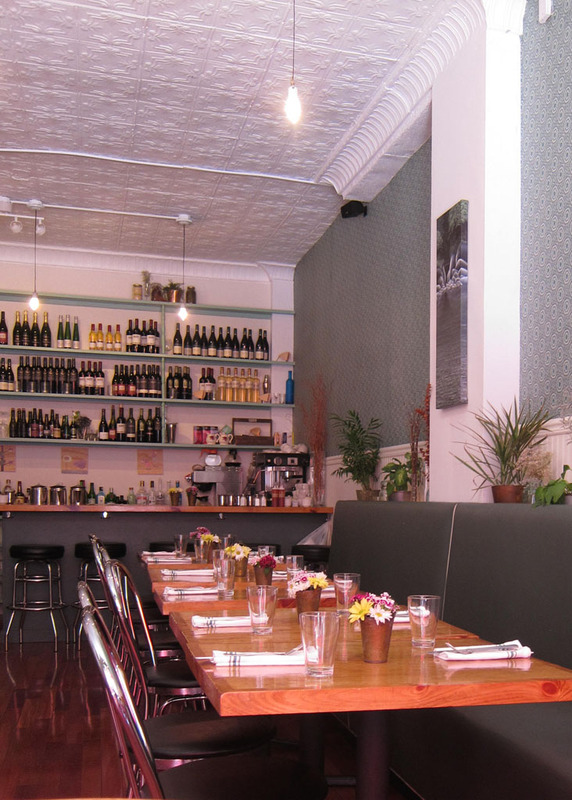 This gives the restaurant a lovely, relaxed, homey feel. With outstanding food, super friendly and attentive wait staff, outdoor seating ready and waiting… What more could you want? I’m already looking forward to our next visit and trying more delicious items off the menu.